This is a super rich, super sweet dessert. The cardamom cream (which was my idea) cuts through the sweetness a little bit, so there's no need to add sugar to it. Its a really festive dish and loved all over India. In the MC kitchen I presented it with chopped pistachio nuts and I also added raisins to the halwa. The raisins are optional, so anyone who doesn't like them can leave them out. The grating of the carrots does take a long time (a food processor with a grater arrangement helps immensely, or get the kids to do it) and this dish generally takes a long time to make. However, it does freeze well, and will keep in the fridge as well. The other option is to roll out little balls of the halwa and roll them in edible silver/ gold leaf. They make a nice gift to someone with a sweet tooth. The halwa does not need to be made super sweet, taste the milk and carrot mixture after adding some sugar, and keep adding more till it gets to the sweetness you like. Break open 8 cardamom pods and slide out the seeds. In a dry hot pan, toast the seeds for 1 minute until you get a lovely aroma. Crush lightly with a pestle and mortar. In a shallow open saucepan, heat the ghee gently, add the crushed cardamom seeds and stir. Add the grated carrots and fry uncovered for 5 min. Reduce the heat, pour in the milk, add the raisins, bring it to the boil, reduce heat again and cook the mixture for an hour or so, stirring once in a while to stop the mixture from sticking. Add sugar, a little at a time and cook the mixture till it thickens and becomes sticky. Chop the pistachio nuts coarsely. Heat the cream with the remaining cardamom pods (split them but don't take out the seeds) and the saffron. Once it boils, take it off the heat and leave aside for as long as you wish to infuse. Before serving, strain to remove the cardamom, whip very lightly (should be thick, but still pourable) and add a hint of saffron to decorate. To serve, put some halwa into a small greased ramekin, pressing it down till the halwa is packed in. Overturn the ramekin on the serving plate, scatter over the pistachio nuts, paint with the silver leaf and serve with the cold cream on the side. The halwa can be served warm or cold. I served it warm with cold cream. 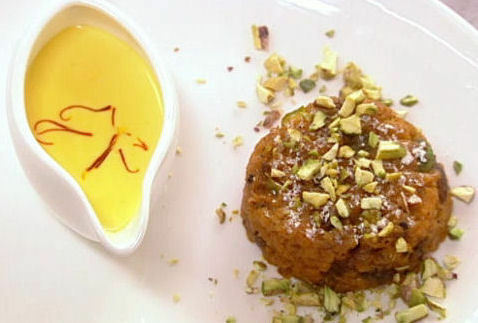 Hi Michelle: I never used to like carrot halwa that much till I watched you on MC. The cream is the perfect accompaniment for CH, cuddos to you. Loved you on the show.